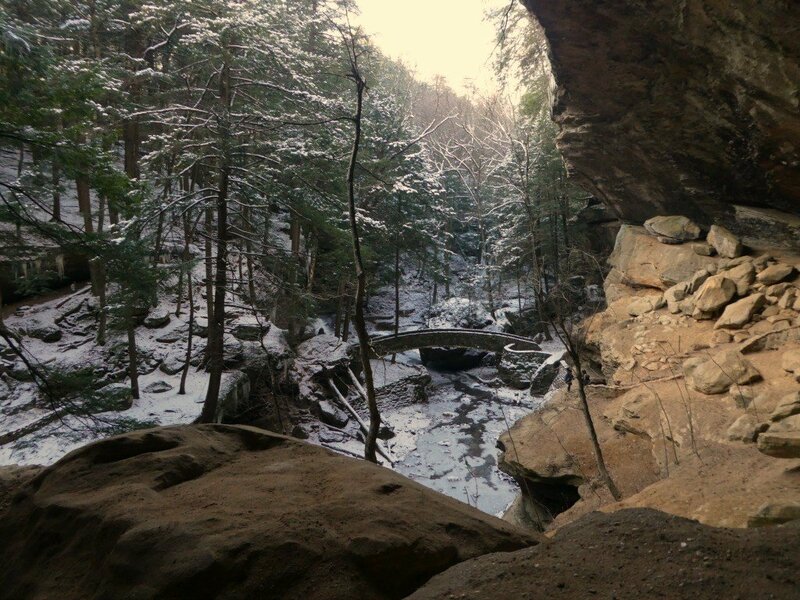 Hocking Hills in southeast Ohio is well known in the Buckeye State and beyond as an outdoorsman (or women’s) paradise. The area boasts hiking trails for all abilities, canoeing, horseback riding, zip lining, ATV trails and is one of the few places in Ohio where one can rock climb. 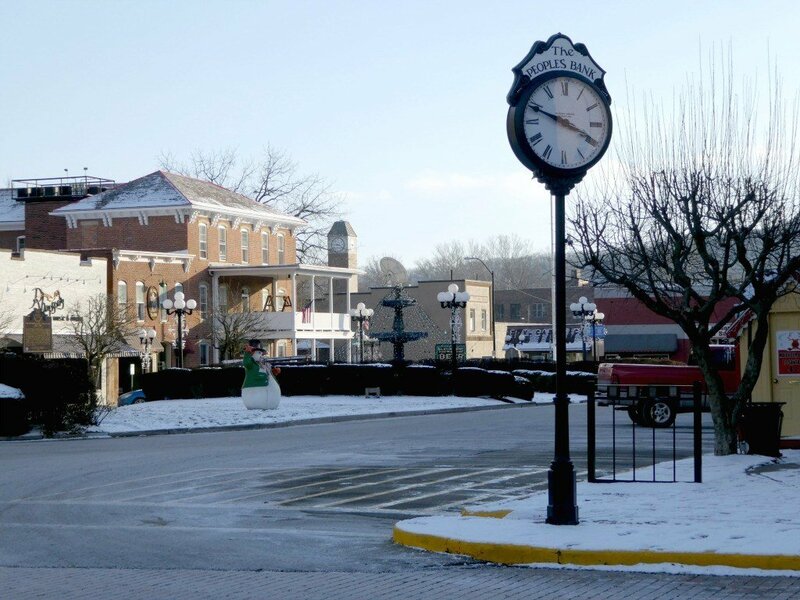 Located in the Appalachian foothills, outdoor activities and fun festivals draw crowds to the area year-round, but there is another reason to visit Hocking Hills- the down-home cooking served in the charming towns of Logan, Nelsonville, McArthur as well as the other dives and diners found along the winding roads of the region. 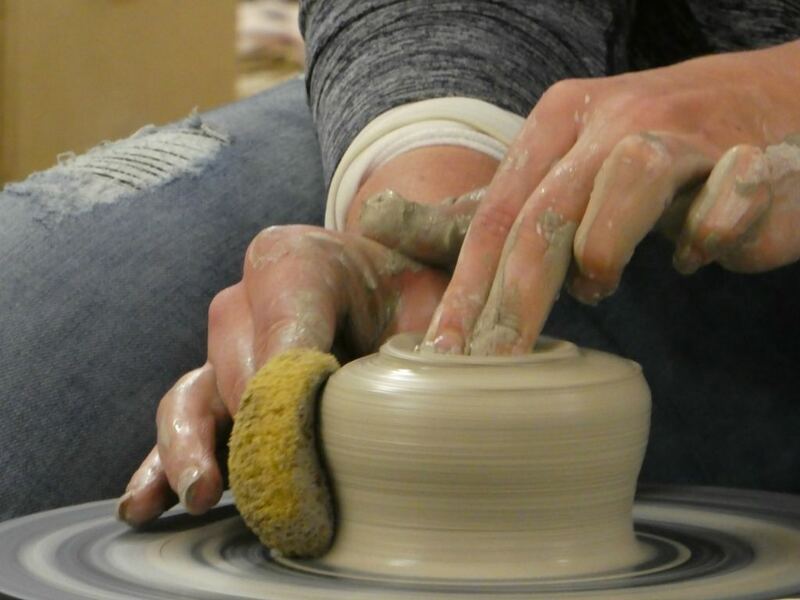 Last weekend, I had the opportunity to eat my way through Hocking Hills, walk off some of the calories I’d consumed on snow covered trails, and browse some of the eclectic shops that specialize in pottery and hand-crafted goods made by regional artists. And you can do the same. 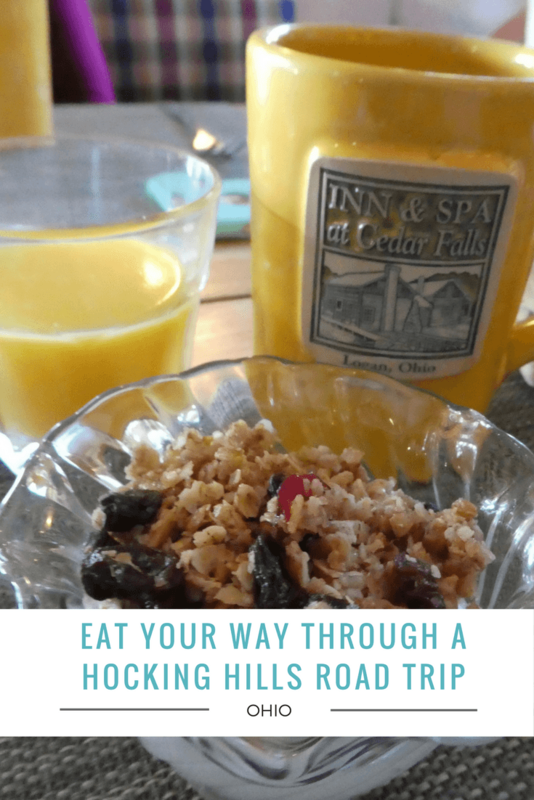 Here are some ideas of how to make the most of your time on a Hocking Hills Foodie Road Trip. While you are welcome to explore the area in a day, it’s so much nicer to extend your stay. You’ll find lodging options to fit every taste, from standard hotel rooms to charming cottages for two, to luxury cabins that could almost sleep an army. No, I’m not kidding. On this trip, I relaxed, ate, and slumbered at Cedar Hill Lodge, which is part of Cedar Hill Retreat. 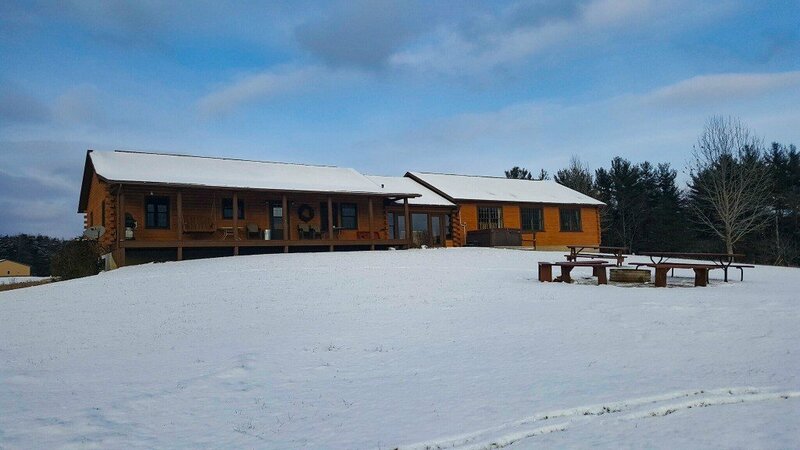 The property welcomes guests to a lodge that sleeps 26 and several cabins for smaller groups or families. The property was easy to find along State Route 664 and offered plenty of space. Highlights include a hot tub with amazing view, a movie room, game room, and groomed hiking trails on-site. Guest Services provides guests access to DVD’s, games, puzzles and brochures of area attractions and restaurants. 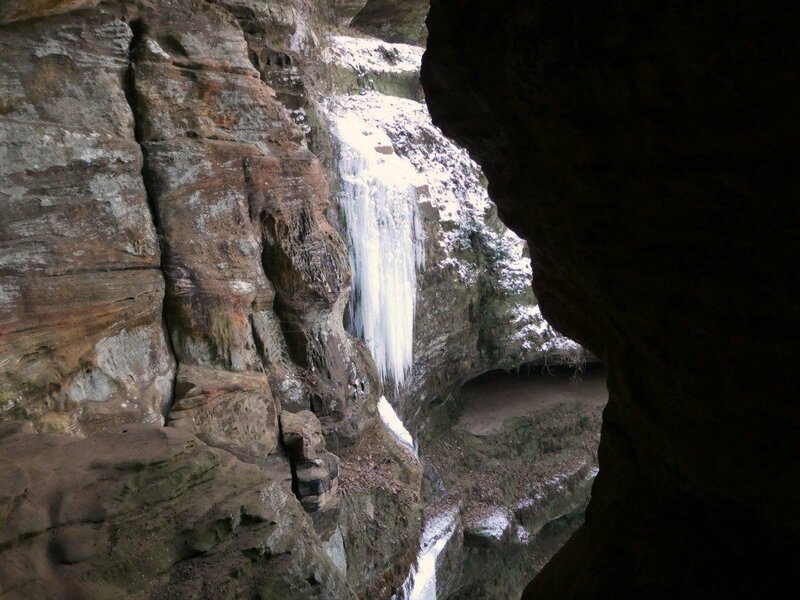 This property is also close to many of the popular hiking trails that include Old Man’s Cave, Cedar Falls and Rock House. The kitchen at Cedar Hill Lodge was large and perfect as a gathering place for guests. Dinner was provided by Chef Matt from the Lake Hope Lodge. 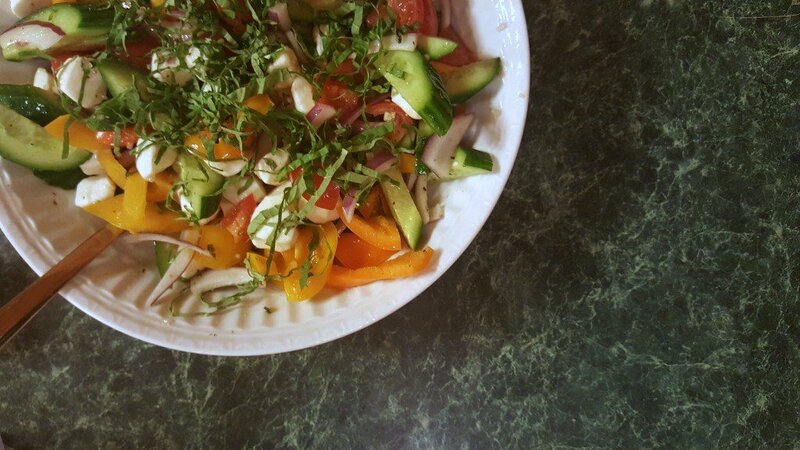 I watched with other guests as he prepared a delicious salad with fresh vegetables that was the perfect complement to the accompanying pasta dishes. One dish was prepared with a clam sauce and the other was tossed with shrimp, sausage and chicken. After dinner, some guests in my party braved the cold nearly negative temperatures to roast S’mores. I was happy to simply savor a piece of chocolate from the warmth of the indoors. My tour of the Hocking Hills restaurants kicked off bright and early at 8 a.m. Saturday morning with a stop at Pearl’s Diner. 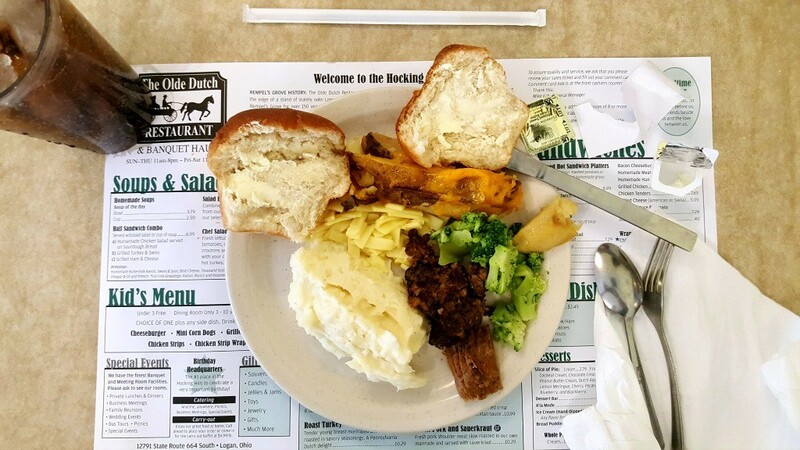 Located in the shopping complex with Walmart, this cozy restaurant is a favorite around locals. 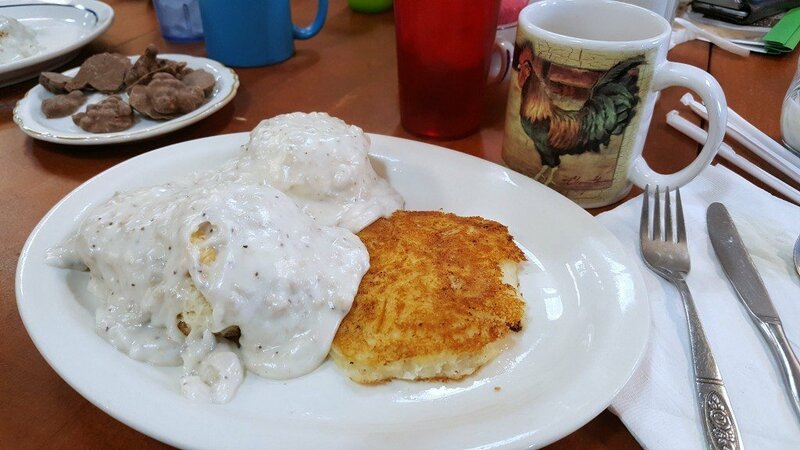 A hot cup of coffee, plate of biscuits and gravy served with a potato cake reminded me of my grandma’s down-home cooking, as did Sandra, the owner. 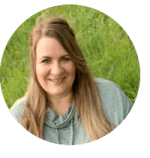 Like many people in the region, I doubt she’s ever met a stranger and I felt comfortable the minute she smiled and opened her mouth to greet me and my group. One can’t eat a plate of biscuits and gravy and immediately want to eat more. 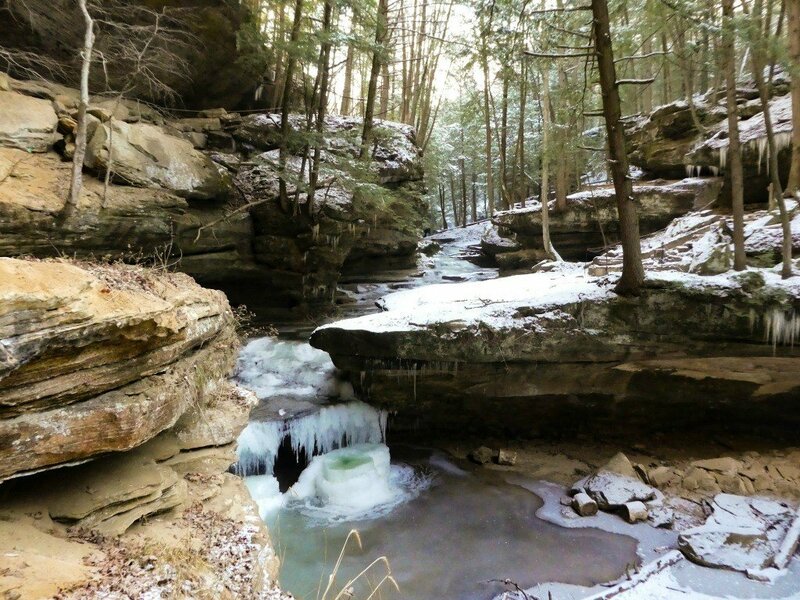 Even though the temperatures were a brisk 6 and 7 degrees, my group braved the Old Man’s Cave and Rock House trails so we could take a few photos of the winter landscape. If you plan to do the same, remember that when hiking during the winter, it’s important to dress practically and not try to make a fashion statement. Keep an eye on the weather forecast and dress accordingly with a warm coat, hat, gloves, extra layers and boots with adequate traction to climb the stone steps and slippery trails. A hiking stick could also come in handy. 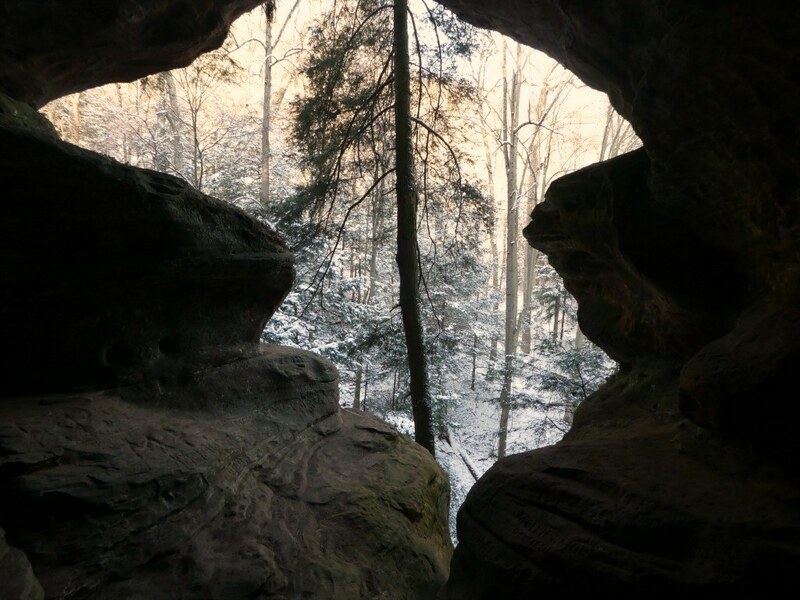 Old Man’s Cave is a fairly easy, paved trail, though there are steps and slippery surfaces so you if you’re hiking with small children or teenagers, make sure they stay on the trail at all times. You can get slapped with a hefty fine for deviating from the path in the state parks so do your part to stay safe and protect the parks for future generations by staying on the trail. Rock House is the only true cave in the park and is said to have been a shelter and hide out for robbers, bootleggers and horse thieves. It has an interesting history and one I’ll share more of later. A trail from the parking lot descends ½ mile to the cave via a dirt trail and eventually steps carved into the stone. During the winter, the trail can be slippery from the fallen leaves and keep in mind that you do need to walk back UP to the parking lot after you’ve walked to the cave. This was a much easier hike for me ten years ago before I gained 60 pounds, but I’m so glad that I made the trek down to see the cave during the winter. As with Old Man’s Cave, if you’re traveling with small children or teens (or adults) that like to show off, be aware that there are cliffs and drop offs in this part of the park as well. My hike was followed by lunch at The Olde Dutch Restaurant, located back in Logan. This property is a popular destination for locals and tourists with seating to accommodate a large number of people and groups. 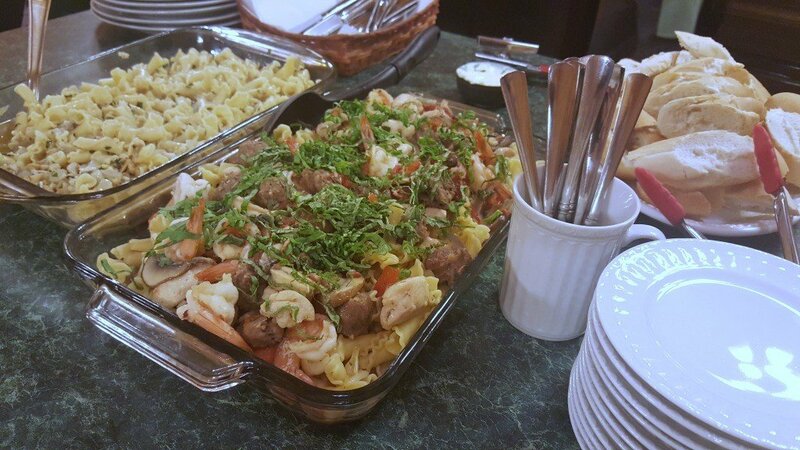 Their specialties are home-made mashed potatoes and chicken noodles which are served separately or on the buffet. If you’re hungry, the buffet is the way to go. You’ll have access to soups & salads, main dish entrees, and desserts. I had remembered how delicious the homemade pies were from a previous visit so even though I didn’t really have room for dessert, I couldn’t resist a piece of the peach pie. I don’t think I really need to question myself as to why I haven’t lost any weight despite my New Year’s resolution to get “fit” this year. Across from the restaurant, you’ll find the Logan Antique Mall with booth after booth of treasures and great prices. I find something I’d like to buy each time I pop in. When you’re done shopping at the antique store, pop into the Midwest Glass Outlet. In warmer weather, Ruby’s Petting Zoo and Hocking Hills Canoe Livery are popular nearby stops. If you’re looking for more things to do in Logan, check out these fun and quirky attractions, both are a must see when in the area. Despite spending time shopping, I really couldn’t eat anymore and either could anyone else in the group, so we drove to nearby Nelsonville. 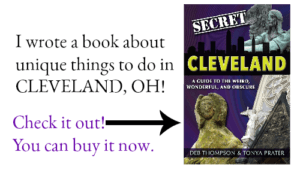 I instantly I fell in love with the historic downtown buildings and murals and was pleased to spot the famous Nelsonville Cross on the hillside, that I’d missed when I was in Nelsonville a couple years earlier to ride the Hocking Valley Scenic Railway. On this trip, we stopped at the Nelsonville Emporium, which was probably the biggest surprise I experienced on this tour. While I thought the store would be “neat” when I initially read about it, I didn’t expect to be wowed and I was wrong. 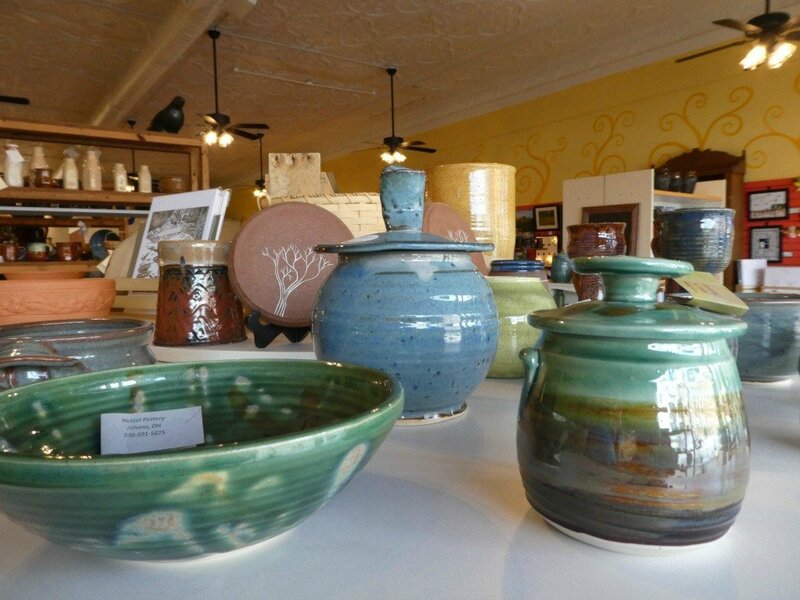 Stepping inside the historic building, I was initially impressed by the collection of wares by local artists- pottery, photographs, hand-made soap, ornaments, and chocolates. The store has a beautifully curated collection. My group even had a pottery making lesson in the back of the store, and while I didn’t participate this time, I did enjoy taking a few photos before I ran out to get some photos of the murals and cross and grabbing a Snickers latte (yes, it does taste just as it sounds) at Fulgroom’s on the square. 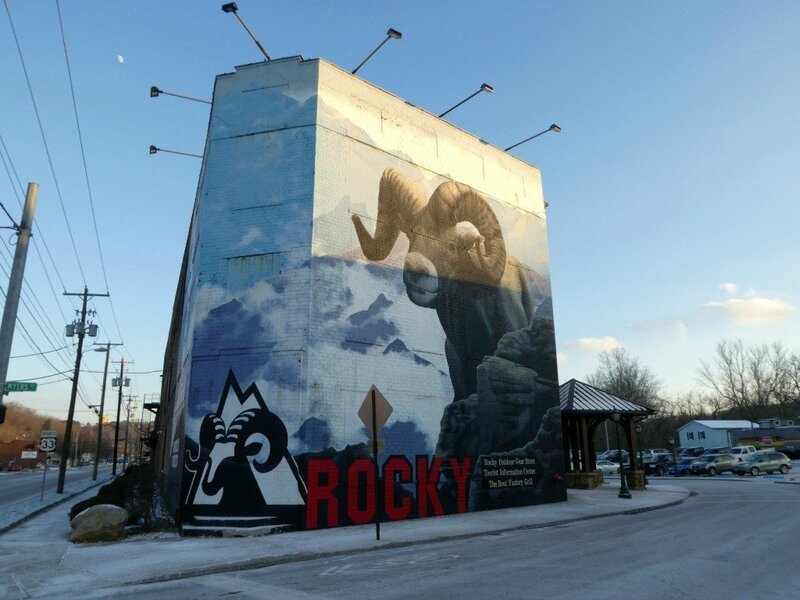 From the coffee shop, I could see the Rocky Outdoor Gear Outlet, where my group would eat our evening meal before spending time browsing the store and shopping. 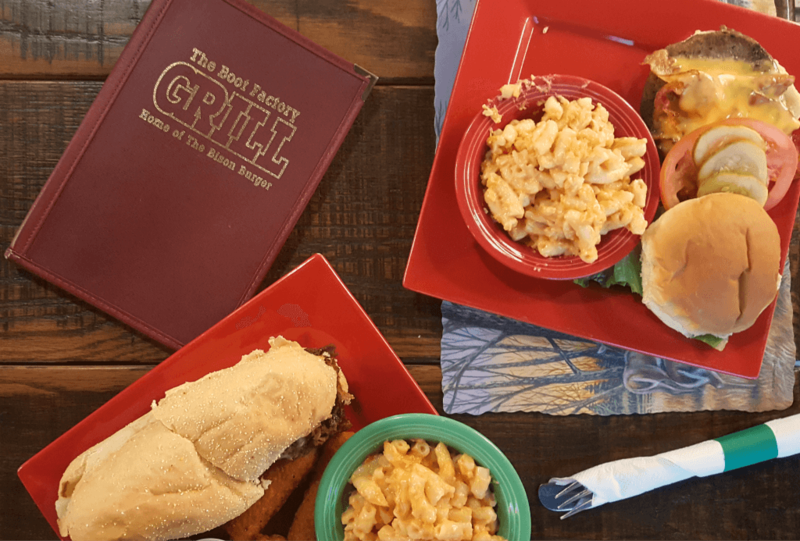 The Boot Factory Grill is the home of the Bison Burger and while I was tempted, I find it hard to pass up a Philly Steak Sandwich, mozzarella sticks, and good ole mac & cheese. The food was good, the prices were family friendly and you’re free to shop while waiting for your dinner. The night was still young so we stopped off at the Hocking Hills Winery on our way back to the cabin. 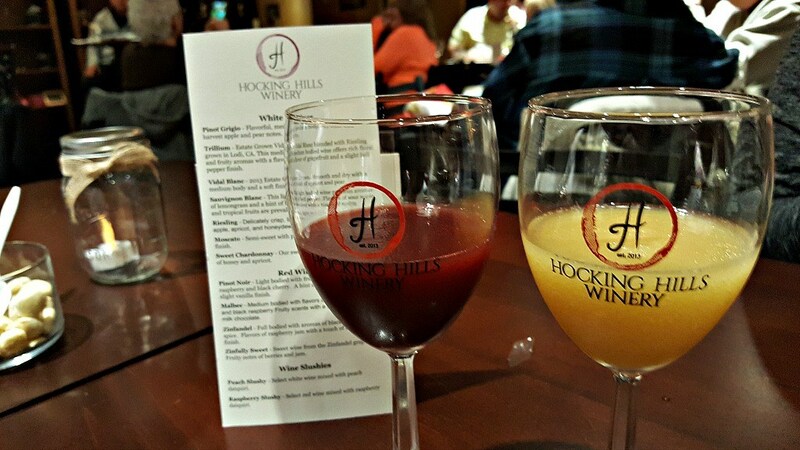 We were warmly welcomed by locals and several of us enjoyed sampling the Hocking Hills wines. My favorite drink of the evening may have been the Peach Wine Slushy. Brownies for Breakfast? Yes, please! 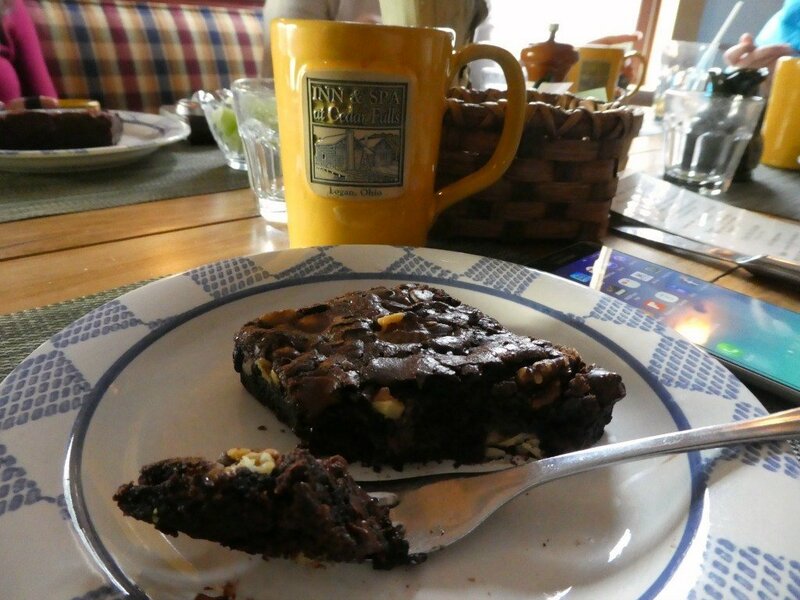 The next morning, my group dined at Kindred Spirits, the charming restaurant on-site at the Inn & Spa at Cedar Falls where we were greeted by the chef, Anthony Schultz and treated to his famous chocolate brownies following our tasty breakfast. If you’re interested in eating your way through the independently owned and operated restaurants in the Hocking Hills area, consider visiting during the annual Comfort Food Cruise which runs the last three weekends in January. In 2019, you can visit January 12th & 13th, 19th & 20th and 26th & 27th. Tickets cost $18 per adult and include 13 delicious stops where you can sample Appalachian cooking at its best. In addition to the stops I’ve mentioned, you won’t want to miss the meatloaf at M & M Family Diner in Logan, the Banana Bread French Toast at Hocking Hills Diner, Jacks’ Famous Cabbage Soup at Jack’s Steak House, Chicken Salad & Chili at Home Tavern, Turkey Pot Pie at Lake Hope Lodge in McArthur, the Chocolate Churro at Maya Burrito Co., Mac & Cheese at Millstone BBQ and the Pizza from the Pizza Crossing. You can purchase your tickets for the 2019 Comfort Food Cruise in person at the Welcome Center or online at www.explorehockinghills.com. You’ll receive a large sample at each participating restaurant, enough food that you’ll struggle to complete this food cruise in one day. Ticket holders are welcome and encouraged to break up the tastings up over the course of the weekend. A portion of the proceeds raised from the Comfort Food Cruise benefit local food banks. In 2017, over $4000 was raised to aid those in the community from ticket sales alone. If you’re not local, you’ll find plenty of places to stay in the Hocking Hills region. Remember, Cedar Hill Lodge, where I stayed is available to rent and they have smaller cabins on the property. I’ve also included additional properties that I’ve stayed at below. A special thank you and shout out to the Hocking Hills Tourism Association, Cedar Grove Lodging and Weirick Communications for inviting me and hosting my stay as part of a media preview of the Comfort Food Cruise. All thoughts and opinions provided are my own.